Develop required Logical Reasoning academic skills. Develop a confident approach to HPAT Logical Reasoning section. This is a hardcopy bound textbook. Explains Logical Reasoning in relation to HPAT. Outlines academic understanding of the Argument, the Question and the Answers. Defines the different types of Logical Reasoning questions. Provides teaching material, hints tips, pacing skills and strategies for Logical Reasoning questions. 200 questions with answers and explanations. Develop required Emotional Intelligence and academic skills. Develop a confident approach to Interpersonal Understanding section for the HPAT. 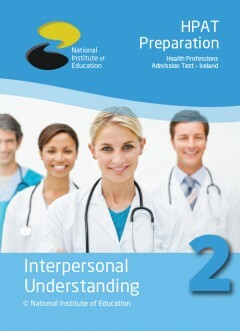 Explains 'Interpersonal Understanding' section in relation to HPAT. Defines components of understanding: psychology, emotions, feelings and empathy. Provides a strategy for ethical decision making. Provides teaching material, hints tips, pacing skills and strategies for Interpersonal Understanding questions. 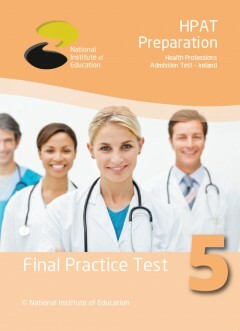 Provides worked examples and a bank of practice questions with answers and explanations. Develop required visual acuity skills. Develop pacing skills and question priority strategy. 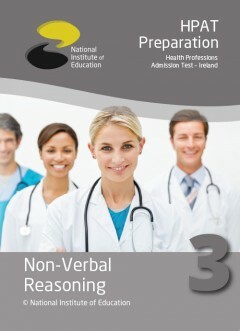 Develops a confident approach to Non-verbal Reasoning section for the HPAT. Selects and defines question types by characteristics. Develops strategies based on identifying logical / physical possible sequences of shapes. Describes strategies for analysing sequence questions. Provides fully worked theory examples and all practice questions with answers and explanations. 500 practice questions with answers and explanations. 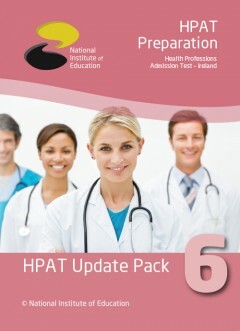 Gain an understanding of current skill levels in all HPAT sections. Develop a planned HPAT approach. Shows how NIE will help you. Provides HPAT 2018 details and dates. Practice Questions and answers for each section. This book is emailed in PDF printable format shortly after registration with NIE. Test abilities under exam conditions. Gain experience of test rules and regulations. An exam based on the information provided by ACER. Same style and number of questions in the same test layout. Answers and explanations to all test questions are emailed after you have completed the test. An invaluable experience and HPAT preparation assessment tool. Allow students to re-assess where they're at, as highlighted by the annual HPAT handbook published by ACER during mid-October. Ensure students are 100% up to date with the latest info, tips and changes for the pending HPAT. Any new and relevant curriculum. This book is emailed in PDF printable format upon your enrolment.